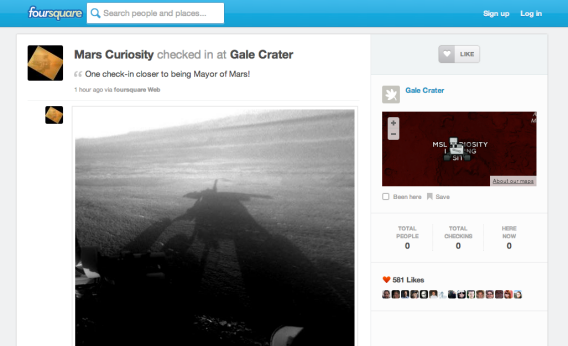 Foursquare on Mars: Curiosity Rover checks in at Gale Crater, aims for mayorship. One small step for NASA’s social media team, one giant leap for Foursquare. For the uninitiated, a Foursquare user can become “mayor” of a given venue by visiting it and checking in via smartphone more times in a two-month period than anyone else. For businesses, it’s a way to make customer loyalty into a game. A local coffee shop, for instance, might reward its Foursquare mayor with a free cup now and then. In this case, Mars probably isn’t going to offer NASA any special discount offers, but it’s a clever way for NASA to engage with Foursquare’s youthful user base as the Curiosity mission wears on. It’s an even bigger boost for Foursquare, a New York-based startup that has long been hyped as “the next Twitter” but is just as often dismissed as boring or annoying. Relying on short messages tied to updates about a user’s location, Foursquare seems like an ideal way to keep up with the Rover as it makes its way across the red planet. If only people’s check-ins on earth were this interesting, I might actually join.